Istanbul is like no other cities that you have seen before! So if your time is limited in Istanbul, just rely on this to do list to have a great time in this fascinating city. Another iconic landmark in Istanbul is Topkapi Palace that is located in Sarayburnu (Seraglio Point) and overlooks the Golden Horn and Bosphorus and has a spectacular view. Topkapi Palace was built in served as the primary residence of Ottoman sultans from 1465 to 1856. It was listed as UNESCO’s World Heritage Site in 1985 regarded as the best example of ensembles of palaces of the Ottoman period. The palace is located on a hilly site and this place is where acropolis of the ancient Greek city of Byzantion located. The construction began by the order of Sultan Mehmed II in 1459 and was completed in 1478. It was turned into a museum in 1924 becoming a first museum in the Turkish Republic. The palace is surrounded by gardens and squares in the area there are many smaller buildings and mosques, bakeries, a hospital and a mint. In the beginning, the palace was built upon a 700.000 squaremeters area being home to more than 4000 people but today it covers nearly 400000 sqm. The palace is composed of 6 main sections which are the Imperial Gate, 4 courtyards and the Harem. Topkapi Palace is also the home for porcelain collections, weapons, armor, Islamic calligraphic manuscripts, Ottoman miniatures and Ottoman jewelry. The most popular jewel in the palace is the 86 carat Spoonmaker’s Diamond which is surrounded in two ranks with 49 cut diamonds. The other attractive items for the Muslim world is Muhammed’s cloak and sword. 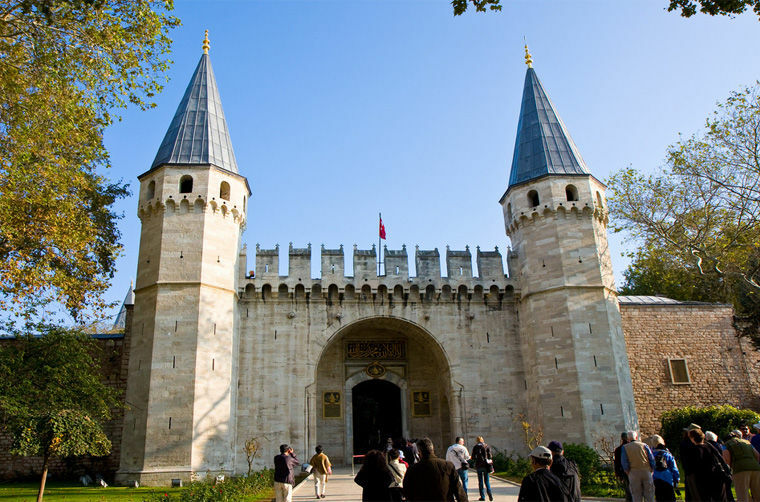 Topkapi Palace is closed on Tuesdays and on the first days of the religious festive days until afternoon. The palace, Harem and the Hagia Irene Museum can be visited between 09:00 – 16:45 in winter season and in the summer season they are open until 18:45. The ticket booth closes at 16:00 in winter and at 18:00 in summer. For the Harem and Hagia Irene Museum, you need buy a separate ticket. To reach the palace by the public transportation, you can use T1 tram line. The nearest stations are Gulhane and Sultanahmet. For more information about visiting the palace, you can see the official website of Topkapi Palace. Known as the oldest and the largest covered market in the world, Grand Bazaar has 61 streets and more than 3000 shops that sell local souvenirs, leather bags, rugs, carpets, jewelry and more. It attracts nearly 300000 visitors each day and 91.250.000 people visited Grand Bazaar in 2014. Its total area is 30700 sqm. Actually the numbers speak for themselves. The construction of Grand Bazaar (Kapali Carsi in Turkish) was started in 1455, two years after the conquest of Constantinople. In the beginning, the shops selling same types of goods were forcibly placed alone one street according to their profession. And all the traders were under the inspection of the Sultan and had to obey the commercial ethic rules. The prices were also regulated by the palace. So the traders of the bazaar were composed of completely reliable and professional sellers. The area of each shop was equal and advertising was uncommon in the bazaar. This landmark of Istanbul is located in the old city and can be easily reached from Sultanahmet, Eminonu and Beyazit using the tramway. You can get on the tramway from Eminonu, Sultanahmet or Karakoy to get off at the Beyazit-Grandbazaar station. The bazaar is open every day except Sundays and on bank holidays between 09:00 – 19:00. Hagia Sophia was built between the years of AD MS 532 – 537 as an Orthodox patriarchal basilica and then converted into an imperial mosque after the conquest of Istanbul. In 1935 it was converted into a museum. Since 1985, it is UNESCO’s world heritage site. Its architecture is considered as the epitome of Byzantine architecture and it is believed to break a new ground in the history of architecture. Although the building was changed with the conversion and the altar, bells, iconostasis and sacrificial vessels are removed, Hagia Sophia is a fascinating structure today attracting 3.3 million visitors each year. When the famous grand dome was placed on the Hagia Sophia, it is said that the walls leaned outwards because of the weight of the dome. Then supporting walls were needed be built. And it is also said that this grand dome and the architectural style of Hagia Sophia inspired the designers of the Blue Mosque (Sultan Ahmad Mosque). Hagia Sophia is a building that is full of mysteries. As mentioned in the documentary that is called “Beneath the Hagia Sophia” there were tunnels beneath the building reaching up to Princess Islands and all the treasures and secret writings are kept beneath Hagia Sophia in case of the sieges. However, the legendary building keeps it secrets. To reach Hagia Sophia, you can use T1 tram line to get off at Sultanahmet station. It is open every day except Mondays between 09:00-17:00 (the last entrance cannot be later than 16:00) in winter and between 09:00-19:00 (the last entrance cannot be later than 18:00) in summers. For more information, you can visit the official website of Hagia Sophia. These Pizzerias in Istanbul will Make You Say "Mamma Mia!"